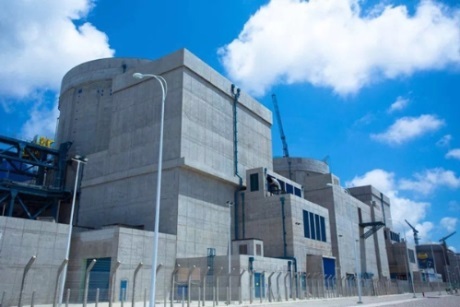 Unit 4 of the Fuqing nuclear power plant in China's Fujian province has completed commissioning tests and now meets the conditions for entering commercial operation, China National Nuclear Corporation (CNNC) announced today. At 5.57pm yesterday, the 1087 MWe CPR-1000 unit completed a series of commissioning tests, including a load test run and a test run lasting 168 hours, CNNC said. Although the company must still obtain necessary permits and documentation, the unit can now be considered to be in commercial operation. First concrete was poured for unit 4 in December 2012 and its dome was put in place in June 2014. The process of loading the 157 fuel assemblies into the reactor core began on 13 June this year and was completed six days later. The unit achieved a sustained chain reaction for the first time on 16 July and was connected to the grid on 29 July. CNNC's Fuqing plant will eventually house six Chinese-designed pressurised water reactors, the first four being 1087 MWe CPR-1000 units. Units 1 to 3 entered commercial operation in November 2014, October 2015 and October 2016, respectively. So far, the units at Fuqing have generated 38 TWh of electricity, avoiding the consumption of over 12 million tonnes of coal and the emission of about 40 million tonnes of carbon dioxide, according to CNNC. CNNC now has 17 power reactors in operation, with a combined generating capacity of 14,340 MWe. China's State Council gave final approval for construction of Fuqing 5 and 6 in mid-April 2015. First concrete was poured for the fifth unit in May 2015, while that for unit 6 was poured in December. These will be demonstration indigenously-designed Hualong One reactors. CNNC expects all six units at Fuqing to be fully commissioned and put into operation in 2021.